Emotional self-awareness involves identifying and understanding one's emotions ― including "big feelings" that can sometimes overwhelm us. As Fred Rogers reminds us: "When we can talk about our feelings, they become less overwhelming, less upsetting, and less scary." Your five-year-old probably has a good grasp of basic emotion words (such as "mad," "sad," "happy" and "scared") and is ready to talk more about what causes people to feel certain ways and to anticipate how they might feel in a particular situation. This type of thinking is a building block of empathy. Picture books are powerful tools for helping kids identify what feelings can look like ― and can help them begin to connect their feelings to the feelings of others. While reading, stop when an emotional event occurs and talk about how a character is feeling. For example, you might say, "Cinderella's sisters just said she can't go to the ball. How do you think she feeling right now? How would you feel if you were Cinderella?" Emotions are normal ― everybody has feels mad, sad, happy or scared sometimes. Emotions are normal ― everybody has feels mad, sad, happy or scared sometimes. Helping kids understand this can ease their anxiety when they experience strong feelings. Share experiences from your own childhood about times you felt scared or upset ― and what helped you feel better. It might sound like this: "You are nervous about the first day of school? I remember how nervous I was before starting kindergarten! I was afraid I wouldn't know anybody, but the teacher played a game to help us learn each other's names. What are you feeling nervous about?" Drawing is one way your child can express and manage difficult emotions. Use this online drawing activity as a tool for your child to express what she is feeling. Otto eats the shrinking potato salad and loses 1 foot when the agents measure his height. 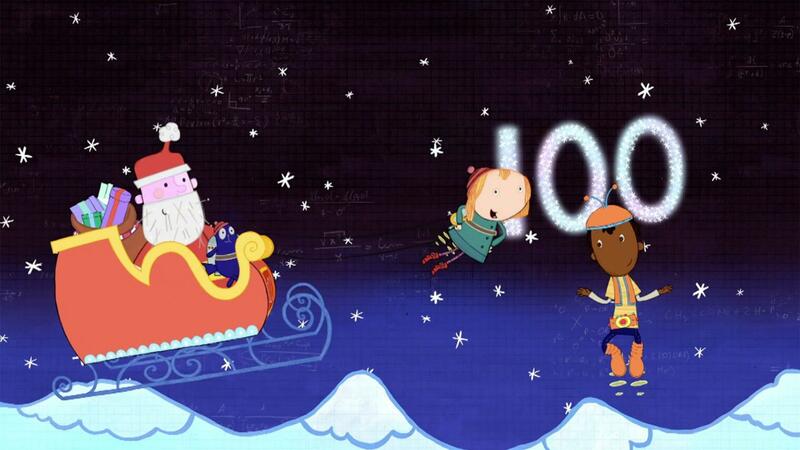 Peg and Cat help Santa deliver presents in 100 sleighs with all of their friends.